Looking for an apartment in Redmond? Hear what some of our residents are saying about The Carter on The Park! If you have any further inquiries, contact our team for more information or to schedule a tour! My husband and I are new to Redmond and we LOVE IT! There is so much for us to try here – new restaurants, great boutique stores and cute coffee shops! The Carter is close to ALL OF IT. I can’t wait to walk to get my grocery shopping done and the Redmond town center could keep us busy for days! My commute is over! 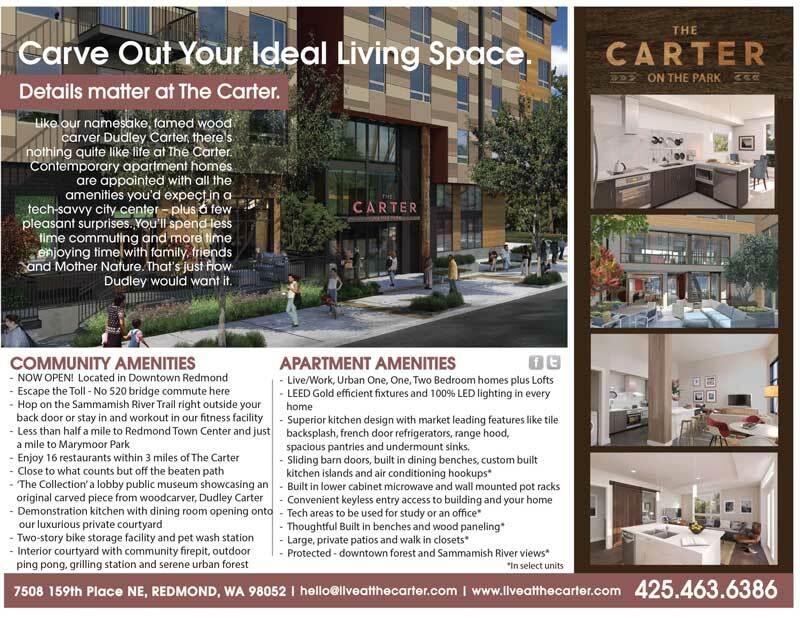 The Carter is in a great location – I will be able to walk to work easily in 20 minutes. If I ever do have to leave Redmond for anything, I can choose from hopping right onto the freeway or walking to the Redmond transit center for a bus! The Carter is the starting block for all things outdoors! It’s perfect in Redmond. Right next to the lake sammammish trail, across the street from a huge community park, AND dog-friendly. My pup loves being so close to the smells of downtown, and I love the easy walks around the neighborhood! I just dropped by this place and I cannot wait to see it completed! The leasing staff is awesome and helpful – especially since the building is still in construction, they are able to answer questions about what will be where in the building! From the natural beauty that already exists, to the building progress being made every day – find your perfect home here in Redmond.